So, you’re worried about getting loads. Yes, you need several good strategies for uncovering hungry customers who are anxious to work with you. But getting loads is just one side of the coin. You also need several good strategies to get set up with good, reliable motor carriers. Getting good paying loads will be one of the first steps in attracting good, reliable truckers. Now, if you are new, good paying loads don’t just drop in your lap. You have to work for them. So, what about attracting trucks? Don’t focus on the rate if your caller considers your rate a “lousy” rate. Be conversational and don’t argue over rates. Be sincere when talking to the motor carrier (MC). Focus on the fact that your goal is to provide the best rate possible to the truck and let them know this. Tell the motor carrier that you are seeking to build long-term business relationships. Ask the carrier what their favorite lanes are and tell them you will explore these lanes with the goal of finding good paying loads for them. If the motor carrier is open to go anywhere, take note of their home base. Tell them that you will need to get set up with them first if you have not done so already. Search for medium-sized trucking organizations and carriers. Use Yahoo Local and search for “Trucking” and start calling trucking companies in any city you like. Start offering fuel advances without hurting your cash flow. Establish benchmarks that you can use to evaluate carrier performance – on-time pick-ups and deliveries, good communications, follow instructions, etc. Offer some type of monthly or quarterly bonuses for those carriers that meet or exceed your expectations. Create a good database to collect information on motor carriers – the better you know them, the better you can work with them. Collect carrier email addresses to send flyers when you know you will be needing trucks in a certain locality. When motor carriers you work with meet or exceed your expectations, call them with no other purpose except to thank them and to tell them how much you enjoy working with them. These are a few tips that might be helpful. Use your creativity to come up with other techniques. In summary, the search for good, reliable carriers will plague you until you are able to narrow your group down to a handful of “partners” that you can count on day in and day out. You then begin working together like a well-oiled machine. The fact is, there are more loads than there are trucks. It’s called low capacity. It won’t be getting much better anytime soon. Sadly, many brokers and motor carriers give up too soon. They just can’t put things together sometimes because of a short term perspective. Success usually falls on those who stick it out with constant improvement. Or, as Ross Perot once said, “Many entrepreneurs succeed because they are too dumb to quit”. You don’t have to be “dumb” to succeed; but you do need to appreciate the nature of service-oriented businesses and learn and apply good business fundamentals like good cash management and creating effective customer acquisition strategies among others. Further, many brokers and motor carriers enter business without proper preparation. They usually don’t last long. It’s only $12 through ClickBank and you can get a refund if you don’t like the book for any reason. You still can keep the book. 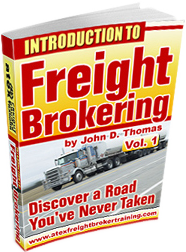 To really learn this entire business from A to Z, you may want to consider comprehensive, detailed freight broker training. Let me know if and when you are ready.